It's funny how much you learn about your own creations when experiencing them in a different environment. Here in California I love the Sèmillon for its weight on the palate and the low tones of fig and beeswax in the aromatics. 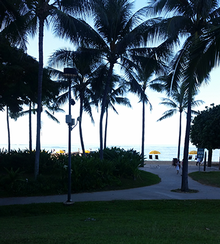 In Hawaii I love the floral, white flower aromas and the refreshing crispness when it hits your palate. It's fun to see the same wine in such different facets, like seeing a painting or photograph you know well and love under different light. Context changes things. Andy: Then why would we stop making it? People will come around. Sure enough they did! Starting in December, sales of the Cabernet Franc have skyrocketed and all the cool kid bloggers are posting stories about how Cab Franc is THE wine for 2016. So many other producers had already given up hope that we found ourselves in the fantastic position of being one of the very few belles left at the ball. Proof yet again that perseverance and a dedication to great wine generally pays off in the end. Usually, conversations with local wine makers and winery owners start with me asking, “What’s new,” or “What’s up?” And as most of us who call Amador County our home know, one of the special features of living here is that you actually meet, work with, play and party with not only friends who work in the wine industry, but also the owners of the vineyards and the winemakers. They are accessible to everyone, making a trip through our region and tasting award-winning wines all the more special. Such was the case when I ventured into Andis Wines (11000 Shenandoah Road, Plymouth), to catch up with Andy Friedlander, Andis Wines owner and Mark McKenna, winemaker. The question, “What’s new?” quickly turned into a conversation worthy of sharing with the readers of the Amador Ledger Dispatch. Andis Wines opened in November of 2010. It is a state-of-the-art winemaking facility surrounded by panoramic 360-degree views of the Shenandoah Valley and the 25-acre vineyard site. What I did not know is that the winery was built to minimize energy requirements and water usage. “The 17,000-square-foot facility is set on an east-west axis in such a way as to reduce heat from the sun, thus minimizing the need for excessive air conditioning during the hot months,” explained McKenna. “We utilize evaporative cooling instead of air conditioning in our barrel and production areas. This is a tremendous energy savings as well as a system that causes less wine losses due to evaporation and allows the wines to experience moderate temperature fluctuations while aging, ultimately resulting in more stable wines.” Indeed, the winery design exceeds California’s strict Title 24 energy standards by over 15 percent. The beautiful decorative stave wall is made from retired and repurposed wine barrels — and includes names of club members in appreciation of their support and love of Andis Wines. One of the big lurking issues for Andis Wines and the winery industry as a whole is sustainability, the hottest topic lately being water usage and the persistent drought we are all too familiar with in California. “Our grapes are almost exclusively dry-farmed, meaning we don’t irrigate them,” said McKenna. The only irrigation used is on newly replanted parcels to ensure vines get properly established. “This allows us to use as little water as possible and force the plants to develop deep and sustainable root systems,” said McKenna. All of Andis Wines landscaping was designed to require minimal irrigation, as well. And in the “What’s New“ category, McKenna was kind enough to show me the steam sanitation process. In the past, washing and sanitizing a single wine barrel required approximately 60 gallons of water. The steam sanitation process is not only more effective, but reduces that usage to just three gallons of water per barrel. “It has reduced the amount of water we use to clean tanks from 200-300 gallons down to less than 15. It’s more effective and ensures the wines are even better cared for than before,” said McKenna. In the cellars themselves, tradition and innovation go hand-in-hand. Using alternative aging vessels (concrete and “flex” tanks) in addition to barrels allows Andis Wines to make wine of more intense character while reducing the need for barrels, saving some trees along the way. My personal favorite is the refillable carafe. “We save a bottle, label, cork and case each time a customer purchases one of our refillable carafes,” said McKenna. “It also happens to be a great deal at $15 for a one liter refill (only $10 if you are an Amador County resident) — because for us, local matters!” Coming soon is the installation of one of only two Tesla and EV charging stations between Sacramento and Lake Tahoe. Building a state-of-the-art winemaking facility and winery that utilizes “green” design is expensive. Andis Wines views it as an investment and critical to the future of the Amador wine industry. The mission is to craft delicious wines with balance, character and complexity. Garnering 90+ point scores in Wine Spectator and Wine Enthusiast, glowing reviews and placements in some of the finest restaurants in Northern California and Hawaii, I would say Andis Wines is the perfect blend of vineyard, winemaker and winery. If you are considering a trip to the Shenandoah Valley and Amador wine country I would encourage you to relax in the picnic area, spending time with family and friends. As their website states, “Our contemporary design, gracious staff and commitment to making superior wines make Andis a must-stop on your Amador wine tasting adventure.” Personally, that statement is 100 percent correct. And knowing their commitment to sustainability and the future of Amador County, California and the wine industry as a whole makes their wine all the more delicious. Amador has made wonderful wine for a very long time — come enjoy the next chapter. Visit andiswines.com for more information on Andis Wines. Every vintage weaves a story all its own and 2015 will certainly be one of the most fascinating if not magical. With the earliest grape harvest in California’s history, Andis started on August 4th with our first Sauvignon Blanc pick. This was quickly followed by Semillon, Rose, more Sauvignon Blanc, and then Merlot and Syrah. Wisdom has it that the best wines are made from grapes with ample hang time; that is, time the grape spends on the vine before picking. But this year did not allow much hang time, yet shockingly, as the fruit started rolling in we began to realize this was some of the most beautiful and flavorful grape we had ever worked with. The sugars on the grapes had been rising rapidly, but they were also quickly developing the delicious flavors we look for as the trigger to harvest, and unlike some sugary years the acid levels of the fruit were textbook perfect. The Estate picking commenced on August 28th with the Barbera and the Schioppettino (what’s that you say?!). These are two Italian varietals that just love the Amador terrior. Fermentations on both of them ran a fairly rapid course. We pressed them off on September 4th and were pleased to see how deeply colored, rich, chock full of well-structured tannin and juicy-as-jam they had developed. This is truly unbelievable wine for 4 year old vines!!! We had been discussing harvesting at night for some time and finally gave it a shot. On September 3rd, we picked our Estate Zinfandel STARTING AT 3 AM! AND WE LOVED IT!!! The pickers are happier because it’s cool at night, the grape comes in colder giving the winemaker more control, and we were all done and cleaned up by 2 PM (yes, a short day for harvest!). 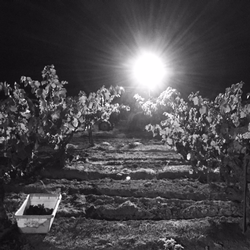 And let’s not forget to mention the fact that the tractors and pickers making their way through the vineyard under the stars is simply a beautiful thing to see – pure magic. We continue this week with more Barbara, Primitivo, and Grenache. The 2015 harvest is a fast one and we certainly have to be on our toes, but it’s also proving to be truly one of the best harvests in Andis’ history. You must come out and see, and of course, taste for yourself! Spring is a joyful time in Amador. While the beauty of the Foothills shouldn't be taken for granted any time of the year, there's a unique joy and energy in the renewal of the land and the vineyards in Spring. The deep green of the hills return, the flowers burst forth, and on a very happy and personal note this Spring, I’m coming home to Andis as Winemaker! I have so missed the winery, the wines and most of all, the wonderful people who grow, create, and drink our Andis Wines. Thank you for your continued patronage. Without you, none of this would be possible. And boy let me tell you, we have some exciting new plans and projects in the works for 2015 and beyond. Stay tuned!! In the meantime, I hope you'll stop into the tasting room soon and say hello! I look forward to seeing you all again friends! The very first bottle of wine Andis ever sold was to our good friend and neighbor, Isy Borjon. He came into the tasting room 5 minutes after we opened for the very first day and bought a bottle of Barbera, took it back home and drank it with his family that afternoon. With every bottle of wine opened and enjoyed, a small story is lived - a relaxing evening, a beautiful afternoon at the winery, a date night, a memorable dinner. That first bottle, that first story, is a perfect way to begin. Here, almost 4 years later, there have been over 150,000 of those small stories lived while enjoying a bottle of Andis wine. We've heard some of those stories from across the globe – pictures of Andis in Egypt, Africa, Mexico, South America, and Europe (check out our Fan Page). It's just amazing all the places and all the stories those bottles have been a part of. 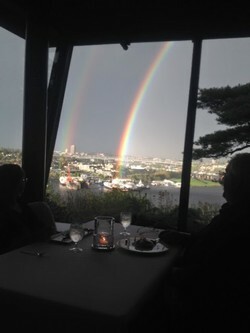 Last week Andy and I were in Seattle pouring the wines at Canlis (view from Canlis at right), one of the truly great restaurants, not just in Seattle but anywhere in the United States. They were gracious enough to add our Semillon and Grenache to their wine list. Now Andis will be represented alongside some of the most amazing wines on the planet. Next week we'll be in New York City pouring at a few of the most incredible restaurants there – such a privilege. We feel so fortunate that people have enjoyed the wines so much and made us a part of their lives. It all started with one bottle, who knows where it can go from here!